To feel a little luxury in our daily life, most of us will put on that glittering necklace or sparkling earrings. At TandCity we may be able to help you add that luxury feeling to your daily life with our brilliant offer of tooth jewelry. We provide Swarovski tooth jewels! These are tiny cristals, which will be bonded to your tooth with a specific dental glue. As you probably know Swarovski are famous for their ability to cut glass in a way that makes them sparkle like diamonds. You decide which jewel you like and on which tooth you would like to have it. 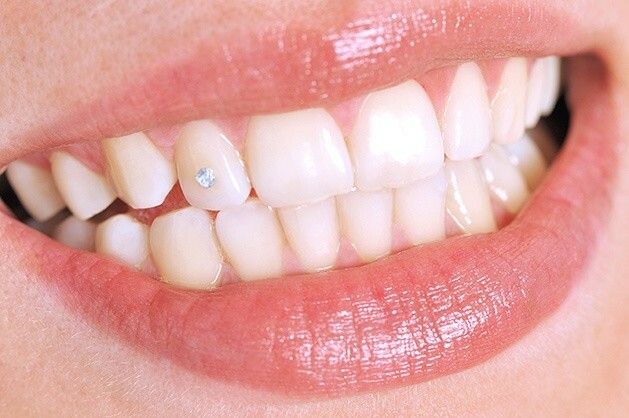 Before the jewel is attached to the tooth, the whole surface of the tooth is lightly polished. A transparent dental glue is put on the tooth where the jewel should be attached. This is hardened with a specific blue light to make the jewel stick to the tooth. With this method the tooth enamel will not be damaged and you will not feel any pain at all. When desired, we can remove the jewel without any problem. TandCity has an assortment of crystals for you to choose between. You may either choose a jewel from our assortment or bring your own jewel, for us to attach to your tooth.